After the will call debacle that occurred last year, I made sure to have our wristbands before we even headed to Auditorium Shores. We walked right into the festival amidst 56-degree overcast that sporadically flirted with drizzle. The ground was damp and my bright blue hoodie was the perfect jacket to protect me from the cold. We trekked through mud and dirt watch Fucked Up tear up the Black Stage. My favorite thing about Fucked up is that they are a true evolution of American punk rock music. With so many sub-genres branching out of the CBGB scene, it’s amazing to see a band that manages to sustain an organic punk rock sound while not sounding like something you’ve heard a million times. From the gratuitous use of guitar2 to the overwhelming stage presence of lead singer Damian Abraham, the band plays live shows with the intensity of GG Allin; only instead of harassing their audience, they embrace and unite them. Abraham looks like a pro wrestler, not only because of his size but also because of how he throws himself around moshing with the crowd, microphone in hand singing away. We’re not only watching a show, we’re a part of it as we all help guide the microphone wire as he navigates through the pit, like a labyrinth of leather jackets and plaid button-ups. Punk rock is fucked up in the best way possible and Fucked Up was the perfect shot of adrenaline to start our Fun Fun Fun Fest adventure. To keep in the theme of artists with names I feel uncomfortable mentioning in front of my grandma, we head over the Blue Stage for Joey Bada$$. It’s around four o’clock at this point and the overcast is making the sky look like it did in the movie Pleasantville before Reese Witherspoon taught Paul Walker how to have fun in a car way before Vin Diesel ever did. To match that sentiment, the crowd was lackluster and dragging. The first ten minutes or so of the set were met with golf claps and uninspired cheering. 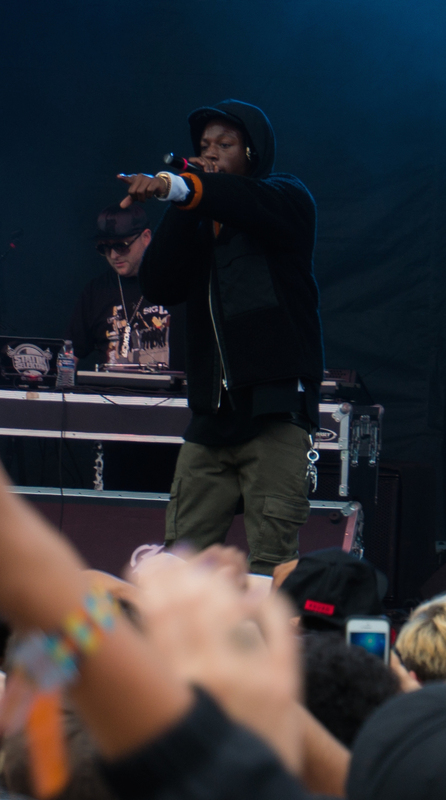 It’s not that Joey Bada$$ wasn’t entertaining, it was just the weather that had us weary. That all changed when he started playing tracks off of his debut mixtape 1999. He told everybody who rocked 1999 to come to the front and like a boost of caffeine, rejuvenated the crowd. He commandeered the crowd through song after song as they bumped and swayed along. For somebody born the year “California Love” premiered, Joey Bada$$ harbors a lot of influence from 90s hip hop in both articulation and choice of samples. He’s got a very nostalgic sound that channels Dilla and is often compared to Illmatic-era Nas. This type of sound stays pretty consistent throughout his Pro Era collective artists whose influences are both eclectic and refreshing,3 Bada$$’ energy and flow gave a hungover crowd a second-wind in the form of a hip hop boot and rally. After an intermission of grass-fed beef burgers and watermelon agua fresca,4 we sloshed through the mud in a light drizzle to the Orange Stage for American Football. We waited patiently as the band set up. We wanted to get a good spot 1.) because my friend loves American Football so much he once offered me double what I paid for the vinyl release of their only album5 and 2.) American Football plays the type of music that is much better the closer you are to the music. 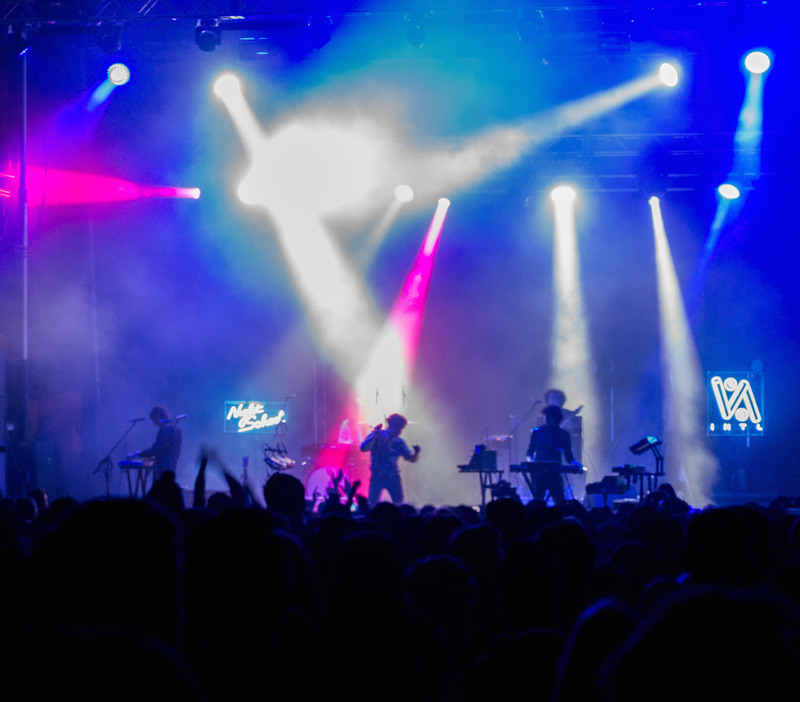 It’s intimate and inviting and often times that is lost in a music festival atmosphere. The night sky took over as exhaustion set in. We casually watched Neon Indian play the Blue Stage from afar, too tired to even attempt to get closer to the stage. We decide, in our current state of being on the wrong side of 25 that it would be to our benefit if we try to get a good spot for Gogol Bordello on the Black Stage. This thought is interrupted by the pipe synths of “Polish Girl” and lure us back to Neon Indian. Their sound is pure dance gold and leaves your blood pumping long after the lights dim. To leave the stage without hearing/watching this song would have been unforgivable. 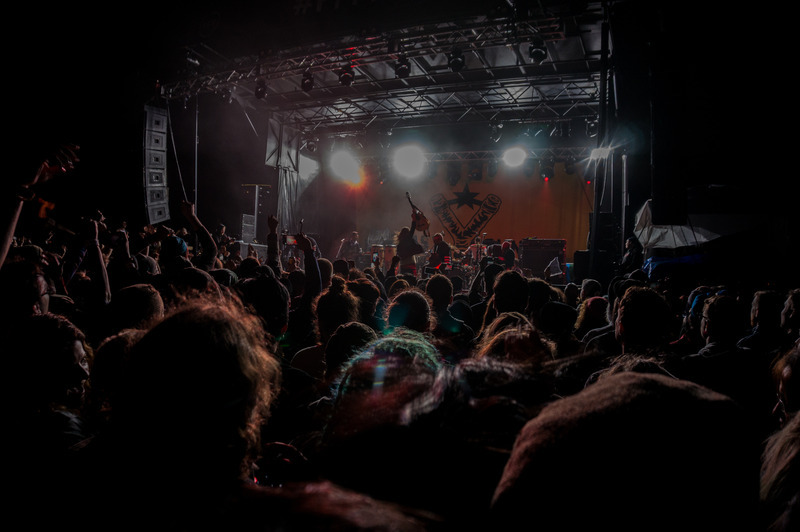 We danced our way to see Gogol Bordello, which to our excitement hadn’t started yet. I know one song from the band and I’d be lying if I told you I could tell you how it goes without hearing it. Front man Eugene Hutz’ self-proclaimed brand of gypsy punk has been prominent for their live show and despite knowing very little of their songs, I wanted to experience it for myself. As we wait around for the band to set up, a very attractive woman approaches my friend and tells him “Hey I’m going to the front, you should too.” While my friend had very little interest in seeing the band, if we’ve learned anything from ‘90s teen movies it’s that when a pretty girl tells you to follow her, you shut up and follow her. As soon as the first guitar chord was strummed she took off with him right behind her. I followed, trying to keep up while I was literally dragging in the mud. The frenetic folk punk carried us to within several feet of the stage. Mosh pits break out left and right like dust devils in the Sahara while the crowd pogoed along. This was definitely the most energetic pit of the day as the band hypnotized the crowd in waves. At this point, my body is reminding me that I’m running on empty and I haven’t even seen Wu Tang yet. We resolve to leave to in order to manage a good spot for the closing act. Up until the opening seconds of Knocked Up, my only memories of the Wu Tang Clan were pop culture based and not musically based. I remember GZA sell Wu Tang Financial on Chappelle’s Show I remember watching Method Man channel Cheech and Chong with Red Man in How High. Of course, I remember watching ODB crashing Sean Colvin’s win at the Grammys to show his displeasure with Puffy winning over them.8 Despite all of this, it wasn’t until the Universal logo on Judd Apatow’s best movie came up and the opening key strokes of ODB’s “Shimmy Shimmy Ya” that I realized the greatness that is Wu Tang. Both my friend and I grew up on NOFX and while, under most other circumstances, we would have ended our night singing along to Linoleum and getting punched in the face by forty year old punkers in leather jackets. Unfortunately, they were playing the exact same time as Wu Tang and while NOFX shows come and go, seeing Wu Tang perform would be something we would never forget. By the time we reached the Blue Stage, Grimes was finishing up her set. With all due respect to Grimes, I wasn’t able to focus much on her set in anticipation. We approached the stage from the right and planned on dashing for the stage as Grimes fans dispersed. Unfortunately for us, with the exception of a few people dressed in neon lit clothes and/or little to no clothes and hula-hoops, the crowd stayed put. Much to our disappointment, everybody in our vicinity had the same idea. Somehow, we managed to get close enough to see RZA’s face without having to squint. We waited nearly 40 minutes before the clan came out and every one of those minutes felt like a ticking time bomb of excitement. We were in the position that not many people have the opportunity to be in and I can say with complete sincerity that this was the reason I bought my wristband for Fun Fun Fun Fest. They took the stage and any notion I had of what their live show may be like before was blown away by the presence. They journeyed through their discography being sure to capture aspects of each of their respective solo albums along the way. They paid tribute to Dirt McGirt himself, ODB, who died over a decade ago around this time by rapping through “Shimmy Shimmy Ya,” “Brooklyn Zoo,” and even “Baby, I Got Your Money.” It should probably go without saying that the most outspoken of the group was a fan favorite and they managed to capture his essence and swagger without missing a beat. 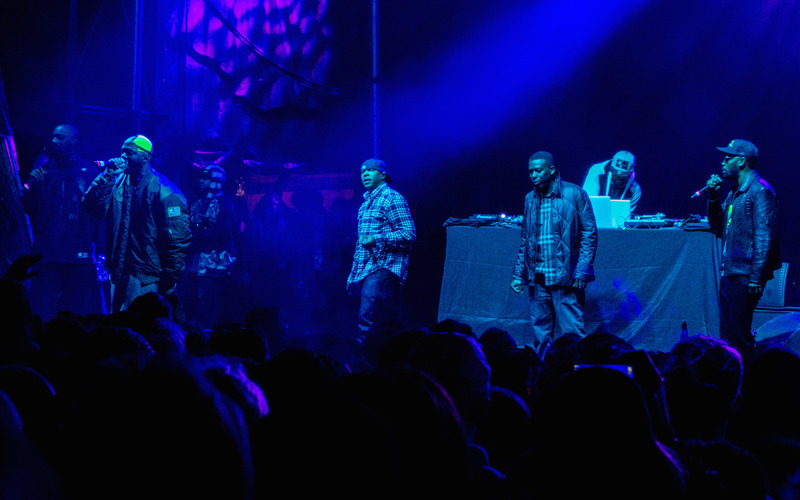 While the clan wasn’t at its full 36 Chambers, for somebody who has been exposed to all cultural aspects of the Wu Tang Clan, I didn’t need to see all of the members in order to enjoy the experience. As I approach the last years of my twenties, it’s great to know that there’s a festival that manages to capture every element of my music listening experience. 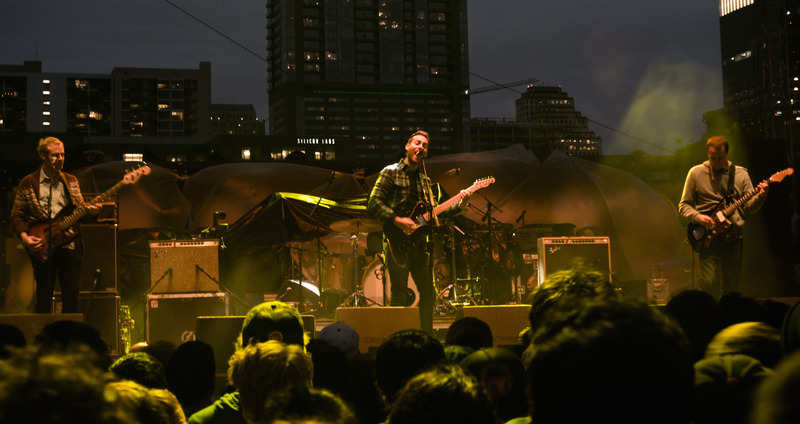 Whether it be through nostalgia, what’s trending, or just curiosity, Fun Fun Fun Fest sets itself apart by bringing a diverse group of bands that entice on all levels. It’s the kind of festival that makes people feel like the bands were handpicked just for them. That’s essentially the feeling I had throughout the day and that’s the feeling I had returning to our hotel room. That’s the essence of Fun Fun Fun and no old guy in his underwear is ever going to ruin that.